What’s infrared and white and smells like burning? 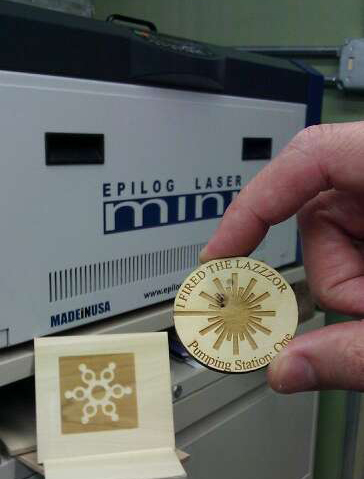 Pumping Station: One is now the proud new owner of an 30 Watt Epilog Mini 24 laser cutter! If you aren’t familiar, a laser cutter can cut detailed parts out of wood, acrylic, and other materials, and it can engrave images onto even more. We’ve already been busy cutting our logo into everything that isn’t nailed down (and doesn’t contain pvc), but we also have certification process ready for any member who wants to fire the lazzzor themselves. Ask about it on the mailing list or come to a meeting to see it in action! * Ok, it’s not exactly white. Wordplay is hard.